Whether it is as a Jewish refugee in Diane Kurys' Coup de foudre (1983), as late 17th-century Madame de Maintenon in Saint-Cyr(2000) by Patricia Mazuy, or as Magistrate Jeanne Charmant in Claude Chabrol's L'ivresse du pouvoir (2006), Isabelle Huppert has given some of cinema's most unforgettable moments a face. Her frequent collaboration with Chabrol has brought to the screen characters such as Violette Noziere(1978), Marie in Une affaire de femmes (1988), Madame Bovary (1991) and Jeanne in La cérémonie (1995). She has worked in France and abroad with directors such as Andrzej Wajda, the Taviani brothers, Jean-Luc Godard, and Michael Cimino as well as Maurice Pialat, Michel Deville, Mauro Bolognini, Marco Ferreri, Benoît Jacquot and Bertrand Tavernier. Isabelle Huppert has won virtually every award there is, among them a European Film Award for La pianiste (2001) by Michael Haneke and for 8 femmes (2002) by François Ozon, as well as a BAFTA and a David di Donatello for La Dentellière (1977) by Claude Goretta, a César and a Golden Bear, three awards in Venice and twice the Award for Best Actress in Cannes. In recognition of a unique contribution to the world of film the European Film Academy takes great pleasure in presenting Isabelle Huppert with the European Achievement In World Cinema 2009 award. 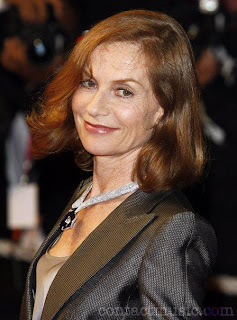 Isabelle Huppert will be a guest of honour at the 22nd European Film Awards Ceremony on 12 December 2009, Bochum.